Each day this week, I'm posting expanded content from my contribution to our church's weekly follow-up devotions. 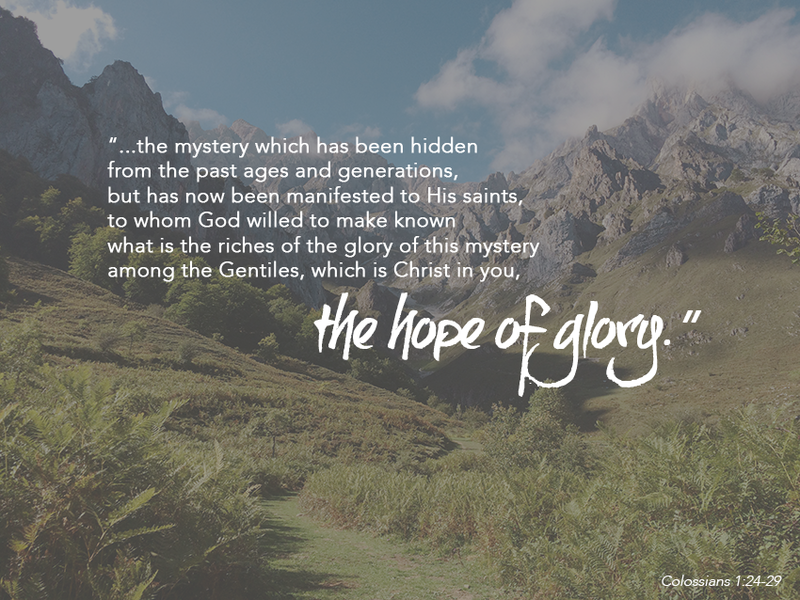 You may recall that the focus passage is Colossians 1:24-29, so although each day zeroes in on one or two verses, you may want to read the entire passage each day, for context and clarity.To read the [intro] or [day 1: the mystery of rejoicing in suffering] - click the links! See end of post for full series content links. Paul chose to rejoice in his sufferings because he saw them as an identifying marker of the life of Christ. He, Paul, was willing to take on suffering “for your sake” – for the sake of the body of Christ. It is a hard thing to consider suffering for the sake of someone else. Paying the price that someone else may go free? This kind of tribulation is rarely one we sign up for willingly! We see an imperfect example here in Paul, pointing to a perfect example in Jesus. The Son of God, who is rich in mercy and loves us with a great and holy love (Eph. 2:4), laid down his life for us while we were still sinners. The perfect dying for the imperfect. Jesus, suffering for our sake, that we could be reconciled to God. And this life – this dying for others, living for others, pouring out for others life – belongs now to believers (Gal. 2:20). This is the power of Christ, which enlivens and strengthens us to lay down our lives for one another (1 Jn 3:16). In a culture hyper-focused on self (in the name of authenticity, of course), it is difficult to imagine a daily dying to self for the sake of others. We are busy structuring our days around the things that benefit us and our business and families. Caring for our souls and loved ones is not inherently evil, by any stretch. But we often overlook ways we may submit ourselves to one another. We rise to the occasion when challenged or reviled, looking for ways to defend our reputations, rather than "trusting the One who judges justly" (1Peter 2:23). "For you have been called for this purpose, since Christ also suffered for you, leaving you an example for you to follow in His steps, nor was any deceit found in His mouth and while being reviled, He did not revile in return; while suffering, He uttered no threats, but kept entrusting Himself to Him who judges righteously; and He Himself bore our sins in His body on the cross, so that we might die to sin and live to righteousness; for by His wounds you were healed." I'm praying this week that I will be eyes-wide-open for ways my life can be about others...my kid, my husband, my friends, and co-workers. Not in some fake-humility way, but in a way that genuinely "looks out for the interests of others" (Phil 2:3). Will you join me in suffering for the sake of the body, by living a life that is for others? For Further Reflection: We don’t often look for ways we can be poured out for others – we are often “looking out for number one”. There is something counter-cultural to the idea of a life that is FOR others. Pray today, asking God to make you aware of big or small ways you might lay down your life – or preferences or comfort or rights – for another, believing that this is the power of Christ in you.